It's not often that a new city emerges in China, rarer still that the new city houses a prefectural-level government. China's latest city, Sansha, has just been established as the southernmost city in the country and it's sure to take center stage as territorial frictions with neighboring countries over the nearby islands - which will fall under Sansha's jurisdiction - continue to heat up. Previously, the tourist mecca Sanya was China's southernmost city. Sansha - which refers to the three islands Xisha, Zhongsha and Nansha, as well as associated islets - didn't have a dedicated local government area, and the city area was defined by little more than a few government buildings on Yongxing Island. 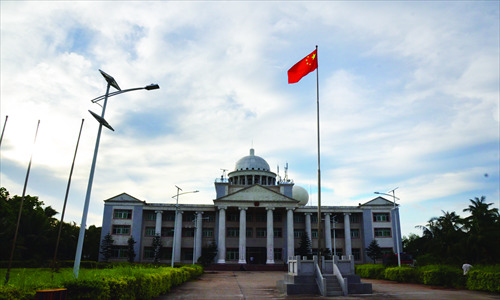 On Tuesday, a committee dedicated to organizing the new city's legislative body was established by the Standing Committee of the Hainan Provincial People's Congress, in preparation for the first city congress of Sansha, which will elect 60 deputies. These deputies will convene to pick out the city's first ever governing body. It has yet to be specified when the formation of the local government will be completed, but the process is being watched closely. On June 21, the prefectural-level city of Sansha was approved by the State Council to administer an island area of just 13 square kilometers, but more than 2 million square kilometers of ocean. Yongxing Island itself is just 2.3 square kilometers, but is home to 833 permanent residents, the vast majority of whom are staff working for local government agencies and their family members. In addition, there are also some 2,000 fishermen engaging in regular fishing activities in the Xisha Islands. While headlines relating to the Sansha area have swept through media reports across the country, the area itself remains mysterious. To lift the lid on this crucial frontier, Global Times reporter Cheng Gang joined the first sailing journey to Yongxing Island after the establishment of Sansha, the nation's smallest prefectural-level city in terms of both population and land area. At 3:30 in the afternoon on July 3, a freighter called the Qiongsha-3, the main sea transport ship providing supplies for Yongxing Island, departed from Qinglan port in Wenchang, a city in northeastern Hainan Province, 196 nautical miles from the island. After around 17 hours at sea, the "lifeboat" for the island carrying around 250 passengers, a majority of whom are rotating employees for various organizations stationed on the island, arrived at the island's port. This journey was unusual as the freighter had a special task. It was transporting materials required for the unveiling of new local government buildings, in addition to its regular mission of replenishing supplies and rotating staff. It was not the first time that the Qiongsha-3 had undertaken such a special mission. According to some of the experienced sailors on board, as early as 2008 the freighter had been transporting the materials required to establish new city government buildings. The plan was resumed this year in the wake of Vietnam's decision to pass a national maritime law that included the Xisha and Nansha islands within its sovereignty and jurisdiction. "Vietnam is lifting a rock only to drop it on its own foot," said one of the crew who has worked for many years on the freighter. "The city of Sansha that was planned several years ago was just a county-level city, whereas the newly established one is a prefectural-level city, the third in Hainan after Haikou and Sanya." "China is serious about its jurisdiction over the South China Sea," he said. This journey's docking port, known as "Xiyu" port, was also put into operation for the first time. It's designed for freighters with a cargo capacity of around 5,000 tons. This also prompted speculation of an upcoming Qiongsha-4, which is likely to have a cargo capacity of 5,000 tons, compared to the Qiongsha-3's 2,500. Over the last year, the Qiongsha-3 has plied the distance between Qinglan and Yongxing 24 times, roughly twice a month, to transport supplies for the island, according to information obtained by the Global Times. When setting foot on Yongxing Island, seeing an array of government organizations and commercial outlets quickly dispels the notion that this island is a desolate backwater. Visitors quickly see a China Mobile store and even a branch of the Industrial and Commercial Bank of China. Within the crowded cluster of buildings, an administrative office building stands on Beijing Road. This road, the city's main strip, is being spruced up in preparation for the new government buildings. It takes merely 20 minutes to tour these organizations and institutions, which are clustered around a small area of the island. Around three quarters of the island's territory is inaccessible to non-locals, as a major part of Yongxing Island is a military zone where access has been restricted as a safety precaution. Airplanes the size of a Boeing 737 can land and take off from the airport on the island - the Global Times reporter saw military jets carrying weapons conducting drills there during his two visits to the island. The situation in the South China Sea is looking grim at the moment, so the city is attempting to chart a course between the development of the local area and economy, as well as increases in military construction, said an official from the island's local garrison under condition of anonymity. A jail is also being built on the island to deal with a long-standing problem for local residents: There has not been an appropriate place for fishermen to be put in custody after being found fishing illegally in surrounding waters. While there are still some uncertainties such as disagreements over the size of garrison that should be stationed within the Sansha jurisdiction, given the areas' importance in defending the nation's sovereignty over the South China Sea, the island's small population of 195 households expresses little concern over their future. Originally from Wanning, southeast of Hainan, 48-year-old Fu Zaichou has lived on the island for about 15 years. As one of the permanent local residents, Fu is now doing business by purchasing fishing products from boats passing by. As far as Fu is concerned, the new governing body will bring new hope for locals. In the past, government agencies on the island were run by the provincial government, which could not cope with local issues in a timely, efficient fashion, whereas "the founding of Sansha would certainly be good news, which would help strengthen the nation's sovereignty as well as give a boost to local economic development," said Fu.